Feb. 14 isn't just about couples anymore. What many people refer to as a “Hallmark” holiday has always seemed like a great opportunity for companies to roll in some extra cash. In the past, brands have spent much of their time creating Valentine’s Day campaigns geared toward couples. But with more than half of American adults identifying as single today, that may not be the best practice anymore. Sure, the lovey dovey holiday hasn’t lost its momentum -- in fact, Valentine’s Day sales reached an all-time high of $19.7 billion in 2016. Yet, that’s because it’s become a holiday that both couples and singles celebrate. Many people are buying gifts and experiences for friends, co-workers and pets rather than that special someone. So if you’re thinking romance is the best way to boost your sales, think again -- it's time to switch gears and start focusing your Valentine’s Day efforts to include everyone. 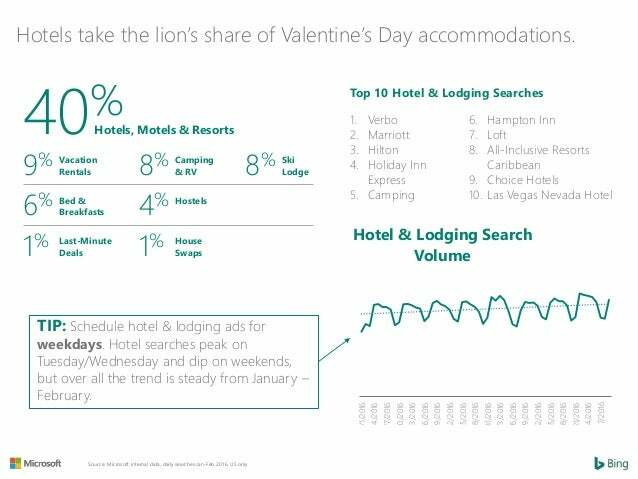 Check out these Valentine’s Day stats from Bing to learn how the holiday has changed over the years. 1. Focus your efforts on single people, just as much as those in a relationship. Half of the American population identifies as single, and of these people, a quarter say they plan to do something for Valentine’s Day. On average, a single man will spend $71 during the holiday and a single woman will spend $40. 3. Many people plan to spend money on their pets for Valentine’s Day. 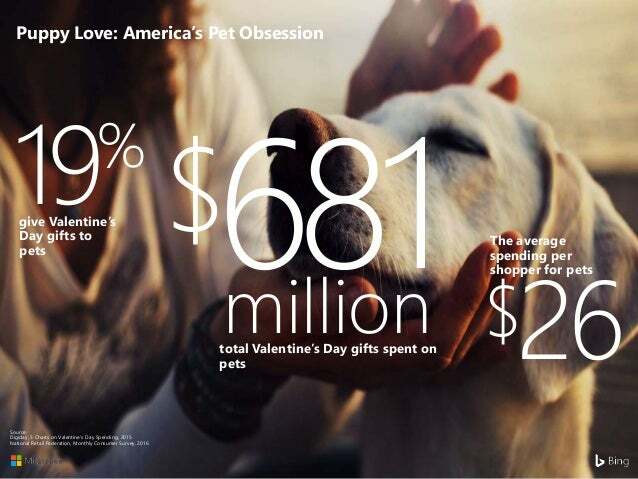 In 2016, a reported 19 percent of people bought Valentine’s Day gifts for their furry friends for a total of $681 million. 4. Unlike Christmas and birthdays, people don’t plan that much in advance for Valentine’s Day. So rather than spending your marketing bucks towards a month-long campaign, just focus on the one or two weeks leading up to Valentine’s Day. Forty-six percent say they’ll start shopping in early February. 5. Year after year, more and more people are shopping on their phones for Valentine’s Day. So it could be a good idea to boost your mobile efforts. Between 2015 to 2016, mobile search increased from 40 to 48 percent on Bing.com. 6. There’s nearly a 50-50 split between people who shop on desktops or tablets and people who shop on smartphones. Those who shop on desktops or tablets are typically searching for handmade or branded items, romantic staples or chain restaurants. People who shop on their phones are looking at jewelry and engagement rings, last-minute gifts and online groceries. 7. If you’re not already spending a lot of your time building up your company’s website or ecommerce page, it’s time to start. Every year, the amount of people shopping online for Valentine’s Day is increasing. Twenty-eight percent of people shopped online in 2016, and 35 percent shopped both online and in-store. 8. People don’t always get what they want on Valentine’s Day, and that’s because most people shop for their significant others without the input of that person. Most often, people receive candy, chocolate and cards on this heartfelt holiday, when what they really want is an evening out or an experience. 9. The holiday hasn’t lost all of its romantic mojo. If you’re advertising rings and/or jewelry -- this is your time to shine. Fifty percent of marriage proposals happen on Valentine’s Day, and on Bing.com, rings generated the most search traffic during the first seven days of February. In 2016, American consumers spent $4.5 billion on jewelry for Valentine’s Day. 10. Thirty-nine percent of people would love the gift of experience -- particularly theater tickets or comedy shows. In 2016, 35 percent of American consumers -- single and in a relationship -- spent nearly $3.6 billion on experiences. 11. If you’re in the hospitality industry, schedule hotel and lodging ads on weekdays. The study reveals that Tuesdays and Wednesdays are the peak days when people go searching for accommodations. People who travel on Valentine’s Day are far more likely (40 percent) to book a room at a hotel or resort, rather than a bed and breakfast or vacation rental (sorry Airbnb!). 12. Whether someone is going on a date or out with friends, 34 percent of consumers plan to eat out on Feb. 14 -- making Valentine’s Day the second busiest day of the year for restaurants. 13. If you’re not seeing any traction with some of your restaurant ads -- don’t worry. People are late planners when it comes to the holiday. In fact, restaurant searches and clicks peak the day before Valentine’s Day. Overall, searches will surge at the beginning of the weekend on Friday and Saturday, and fall near the end of the weekend on Sunday and Monday during Valentine’s Day season. 14. Valentine’s Day is a great day for local and small businesses. Year over year, Bing.com saw an increase in local searches by 9 percent from 2015 to 2016, reaching 88 million total searches. 15. Although many people say they want an experience on Valentine’s Day, more than half opt to stay in. Turns out, “Netflix and chill” has become so popular that many people would rather kick back, order takeout and binge watch Stranger Things than get dressed up and go out.